After almost 10 fun filled days and nights with mi amigo Chris, it was time to fly solo for the rest of this adventure. Chris took off for Rio to complete the rest of his trip and I found myself alone for the first time since I started this trip. It was probably a good thing that yesterday was purposefully going to be a quiet one so I could digest this change. The situation almost became a lot worse when the A/C unit started making what at first sounded like death rattles. Given that it was almost 90 out at the time, this was not a good time for that to happen. I turned off the unit and waited a few minutes, hoping that whatever had happened was temporary. When I turned it back on, thankfully, that proved to be the case. Surviving that potential disaster, I decided to continue to walk around my new surroundings. It was still fairly warm around 8PM but a slight breeze made it OK. I was surprised how many people were out and about – walking their dogs, sitting at cafes, enjoying the warm night. I wasn’t sure what restaurants would be open so I decided to try the nearest one that was. That turned out to be a place called Dacacondo, a typical neighborhood parilla. I wasn’t entirely sure how the menu worked and wasn’t going to get much assistance from the impatient woman waiting for my order. I decided to wing it and get the pollo champignones, chicken with mushrooms. It was incredibly cheap – only 36 pesos – so I wasn’t sure the portion size or exactly what I’d get. After about 15 minutes of watching this young guy work a very cool old school brick oven, my order was ready and I took off. I was pretty sure that wasn’t chicken with mushrooms, let alone cost only 36 pesos. Still, given that I had been craving empanadas earlier that day but was denied as the place was closed, I took this as a sign that the food gods that they wanted to fulfill my wish. And who was I to deny that? 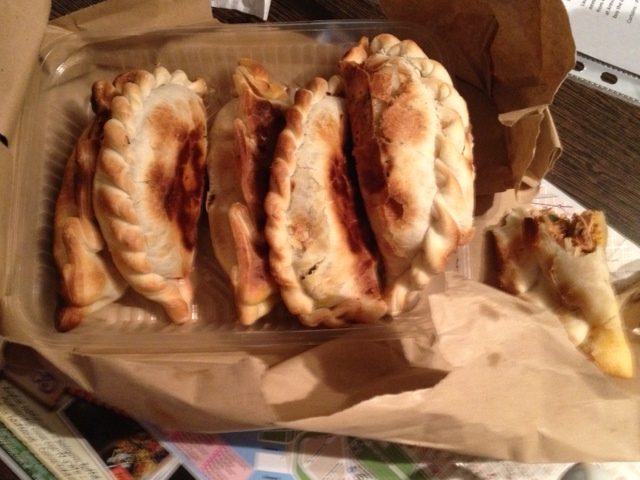 The empanadas were delicious and huge (each was about the size of my hand.) All in all a very good first evening flying solo. Posted on January 8, 2013 by reyalto. Bookmark the permalink.